I try to have a grill-out party each Wednesday night. Last night’s weekly shindig ended up being just the lady and I. 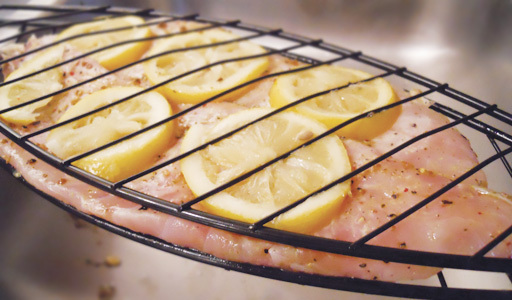 We got fancy with some grilled rockfish marinated in lemon, peppercorn and basil. Some butter was involved as well. I find it easiest to strap your fish in the basket and smother it with fixings while over the sink. This way you won’t dirty up the kitchen too bad. Nobody wants that. I painted it with a some melted butter and squeezed lemon slices. The pepper and basil were applied after that. As you can see, I strapped the lemon slices inside the basket. This ensures for lemony greatness once placed on the grill. For a side we grilled up some asparagus. To marinate, I let it sit in a bag of olive oil, lemon juice, pepper, garlic salt and basil. I like grilling them until a little black and crunchy on the ends. While we ate we watched Shrink, with Kevin Spacey. It’s a really good movie and you should check it out. If you are into Netflix you can watch it on your computer right now. I am a designer, developer and music man. I usually grill out on the roof of my downtown Seattle apartment... when it's not raining like it is today.